Despite some pretty stormy weather the last couple of days the start of the week brought some milder weather and the first sightings of the beautiful Brimstone Yellow Butterflies to our garden - pictured here on the Pulmonaria - they look rather striking with the bright blue flowers - posing perhaps!? 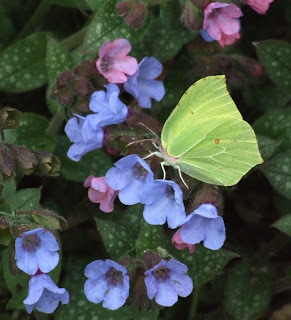 During the week I've also caught sight of a couple of Comma Butterflies too but they were flying around so no photo I'm afraid. A few nights ago I came across the first hedgehog of the season - presumably out for a stretch leg and a munch after the long winter hibernation! The best sighting this week - just yesterday was my first swallow - a male swallow which greeted me on my return from a hard day's work and then today on my morning stroll with Lucy - loads all sitting on the telegraph wires and chattering away "swallow-style" and there were also quite a number flying really low over the fields searching around for insects I suspect - it was quite amusing to watch as they darted they way around the herd of cows - the cows seemed quite unperturbed! The moment the swallows arrive is always a very heartening and special moment and I'm in awe of these small birds which travel all those thousands of miles against the odds and seem to arrive back here each year - incredible! I always feel priviledged that they would choose our barns to nest in. It was funny talking to my sister this morning as I was telling her that the swallows were early this year - last year they arrived on the 28th March to which she replied - "only you would notice these things as living in London when would you know they'd arrived?" and she's right - the coming and going of the seasons are so much more apparent when you live in the countryside and I think you have time to notice which is one of the things I love... isn't this what life is all about!? 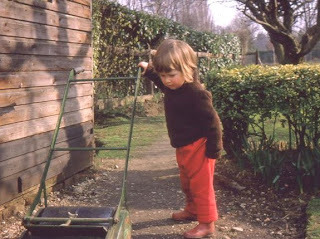 At the tender age of 3.5/4 showing an interest in grass cutting ... mowers have changed a little since then! 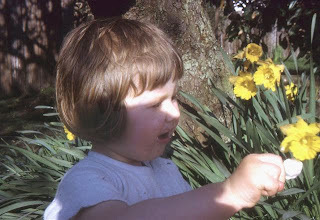 Apparently this was me sharing my ice cream with the daffodils... not sure if they appreciated the sacrifice! 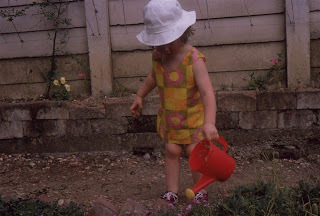 It is interesting looking back and wondering what part parents play in the path you take in life, but some of life's passions and interests clearly start early on... perhaps it's an in-built thing but perhaps it's the patient hours parents spend showing you the pleasures of growing your own fruit and veg are actually very rewarding and a lot of fun... 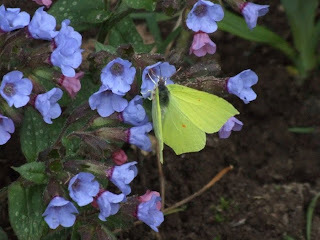 I can certainly remember the rewards of sneaking off behind the raspberry canes for a quick snack! Mind you, I can also remember the many afternoons in late summer going blackberry picking with my family and after the novelty quickly wore off finding it rather boring .... something I've picked up again now and love! 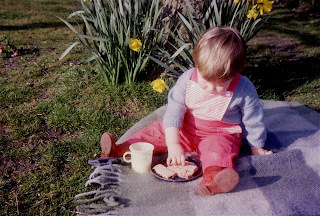 My Mum especially spent many hours "splaining" things to me following my endless questions of "why this or how's that? ", whilst the enjoyment in what I'm sure were painstaking hours that my Dad spent in the greenhouse and on his veg patch has certainly rubbed off - whatever it was, it makes life worth it as does being able to share it and encourage others with the same!